Little Red House: Tagged Again! I've been tagged my Michelle, of I'm A Little Teapot, to play the Seven Interesting Things game. I did this not too long ago, so let's see if I can come up with seven more. I love to sing. By myself. When no one is around. Once, I was wailing away in the garage, when my neighbor happened to stop by. Major embarrassment. I'm a frustrated artist. I used to draw, and paint in watercolors. 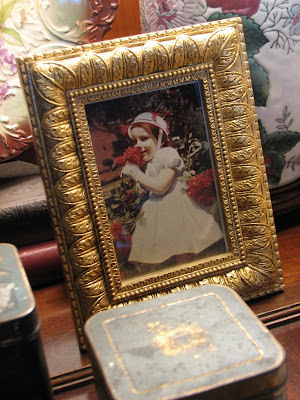 Now I channel my artistic urges by shopping in thrift stores, arranging my finds, and photographing them for you. I am addicted to Sudoku, the Japanese logic puzzles. Have you tried them? They're great. I get nervous if I don't have something to read. My husband and I both read at the dinner table. Yes, I know this is rude, but I guess it's OK if everyone at the table is doing it. In person, I'm very quiet and shy. Online, I can schmooze with the best. Go figure. I love the smell of horse manure; it reminds me of my childhood. Cow manure, not so much. Chicken manure -- yikes. Well, there you have it -- me, in a nutshell. I find it really hard to choose others to tag, so I'm just going to leave it open to you. If anyone wants to play, consider yourself tagged! Hey, Miss Popular:) I would love to see your watercolors sometime, if you feel like sharing. I'm like you, in person, I'm not so talkative, but on line....I am blessed with the gift of gab! Morning! Thanks for the list of fun facts -- and you do write wonderfully! I'd love to see some of your artworks -- maybe corners around your wonderful home? And your arrangements do show the eye of an artist -- great sense of balance for the colors and textures! Love the fact about reading at the table -- I must have a book or magazine around! And Bookshelves! And reading lamps by a cozy chair! Love the interesting facts. I love to read also and get "nervous" if I am on the last unread book. I do sudoku, but only online. I have to check my answers constantly and if I get messed up, I have to quit and start a new one. Obviously some sort of undiagnosed learning disability from way back, LOL. I am really enjoying your blog; keep up the excellent work, or is it play?? Oh my gosh...I have to have something to read too!!! I actually even take a magazine, catalog, book or something with me when we go out to dinner and will read in a restaurant. My husband is used to it. Enjoyed your list. Thanks for stopping by my blog. You're welcome anytime. I love reading your list of idiosyncrasies! I totally identify with the singing.. can sing my heart out in the bath..and being shy.. my alter ego writes my blog! Another fascinating read... thank you! I considered myself tagged because I wanted to play, too so I listed 7 things about myself and sent the tag on to others that want to get in on the fun. Fun things about you. I don't like unloading the dishwasher, too fiddly, but like vacuuming, and I, too, have the heart, but not the voice of a great singer. 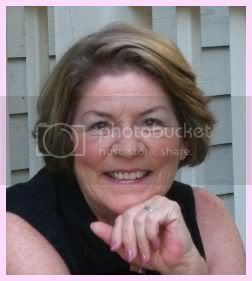 Mary, thanks for coming by my blog today!! I think we are supposed to be friends because my dream is to live in a little red house! And half of your tag comments are exactly like me (except the horse manure which we've been around with my daughter's riding lessons alot in the last 3 years!!). I love your photos on your blog...I'm running out the door but I could write so much more! I'll check back in with you!!! I hate to empty the dishwasher but like you I get nervous if there isn't any fresh reading material around. Great post! It is so much fun to learn these little facts about you! I love to sing too - can't carry a tune though :-). How hilarious about manure!!! ROFL! Hi, Mary BUONA DOMENICA !!! Thanks for playing along :) We have more things in commong than I knew..
Love your list as always! I am a frustrated artist too...and oh how I hate cleaning bathrooms and vacuuming!! I can dust all day but bathrooms? *shiver* I really think we have an awful lot in common...how I wish we lived closer!